If you’re a passenger in a defective plane, the best you can hope for is the best pilot possible. Say what you will about the state of the New York Mets, they still have a winner in charge. You think it’s bad? If Sandy Alderson hadn’t been steering, we’d be at the bottom of the Hudson right now. Almost every move Alderson has made since taking over in 2010 has been golden. The Mets’ farm system, decaying when he took over, is now near the top of the majors, headed by pitchers Noah Syndergaard and Rafael Montero. But his specialty is the pump-and-dump: The best example is R. A. Dickey, a cheap free-agent-to-be the Mets swapped for Syndergaard and Travis d’Arnaud from Toronto. (Syndergaard is now one of the top pitching prospects in baseball and was only the second most valuable player in that trade.) Alderson had done the same a year earlier, turning Carlos Beltran into Zack Wheeler, at the time the Giants’ pitching future and now the Mets’ likely opening-day starter. In an age when prospects are the highest-­valued assets in the game, Alderson, somehow, pried away three top ones for players with expiring contracts. No other G.M. has been able to wrangle up even one player like that in a similar deal. 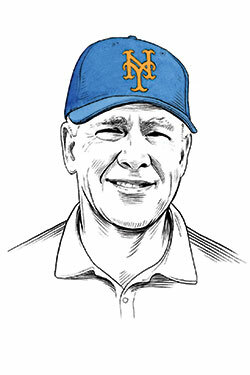 The Mets are still a mess, but Alderson is the last person to blame for that. And don’t look now, but he may even have brought them to the verge of being good. When Matt Harvey returns in 2015, anyway.